At the beginning of every season, the West Coast Eagles descend on a regional town in Western Australia to give back to the community and encourage participation in footy at a grass roots level. In 2019, the West Coast Eagles visited Cervantes, Northam, Port Hedland, Newman and surrounding towns for the annual AFL Community Camp program. Over the two days the squad visited schools, aged care facilities, hospitals, community centres and public visits to sponsors before the day was through. Players also hosted an open signing session for the local community, ran a training session with local players, facilitated a coach education session for local coaches and attended a community dinner event to assist the fundraising endeavours of the local clubs and communities. Since the AFL Community Camp initiative began in 2003, the Eagles have visited regional towns all across the state, including Kalgoorlie, Albany, Northam, Esperance, Bunbury, Geraldton, Karratha, Port Hedland, Newman, Carnarvon, Exmouth, Busselton, Margaret River and Broome, providing a rare chance for West Coast supporters to meet their heroes before the season proper gets underway. 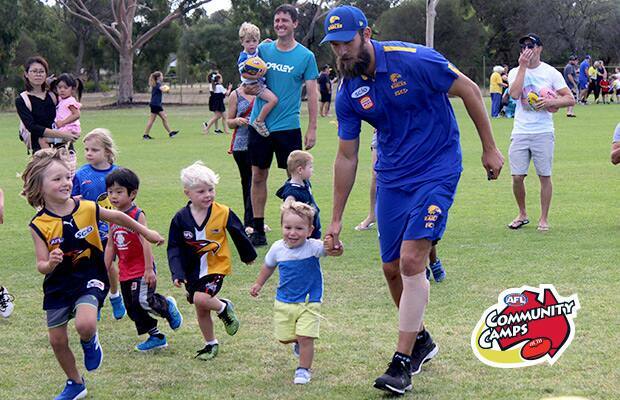 AFL Community Camps help to improve the accessibility of the West Coast Eagles all over the state and provide a chance for to get up close and personal with their favourite football stars. The camp is also an important opportunity for players to interact with regional fans while spreading blue and gold passion across Western Australia.